Contrary to popular belief, I have other hobbies besides woodworking. One of which is video games. Specifically, roleplaying games (both MMOs and console). I’m really good at tradeskills in MMOs. Like super good. Like it’s the main reason I started making things in real life. I just saw that EverQuest is lauching a new timelocked progression server this summer and the vote (I voted twice, because I have two EQ1 Gold accounts) came out in favor of Slower Progression. I started out on the Rathe server (FOR LIFE! ), but I have been bouncing around other servers (Vox, Vulak Aerr) and I like the EQ1 progression server concept. I tried Project ’99, but I would prefer a server that is up through Shadows of Luclin (Maiden’s Eye and Grieg’s End are by far the best zones in any MMO ever, other than Dragon Necropolis). Seems like the second round vote is going in favor of a slower progression, which is right up my (and my buddy Matty’s) alley. I’ve been a healer in MMOs for a long time (mostly because no one else wants to do it and I enjoy willing groups to success), but I think on the new EQ progression server, I will be a monk or a magician. Maybe even an enchanter. Just to stick it to Matty. And because I love the Jewelcrafting tradeskill the most. 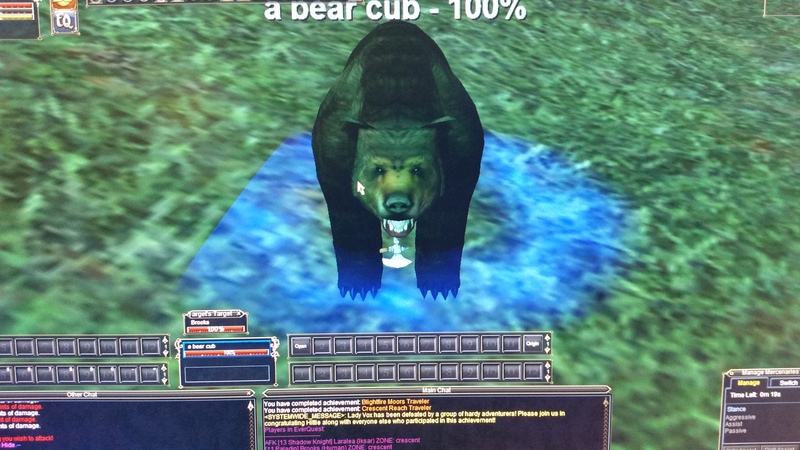 This is a bear cub wielding an ax in Crescent Reach. Anyone who has been thinking of getting back into EQ1, I would urge you to keep an eye out for the new progression server launch. I certainly am.